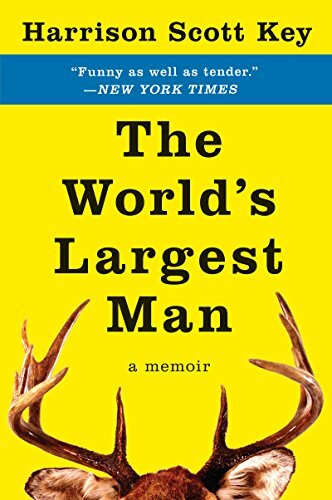 The World’s Largest Man is about boyhood, manhood, and personhood. Harrison Scott Key strikes that perfect balance between humor and poignancy. Using duct tape and carcasses of animals to construct a manly statue of his father—and ultimately of himself—he is almost always funny and never schmaltzy or maudlin. Key spent his early childhood in Memphis, Tennessee. But Key’s pop, who was a country boy, found Memphis “too progressive” and “did not know what to think about sidewalks” so he moved his wife and two sons to a place where they could grow into “real men.” Key was in fourth grade when his father moved them “down yonder” to Mississippi. “Finally, I laid the dove across a root, pushed aside any lingering shame, said a prayer, and stepped on its little skull. It was my first time to kill a thing. And this, in a dove’s skull, was Key’s childhood. Preferring to go grocery shopping with his mom or tiptoeing off with a book, his pop would wake him up at 4:00 a.m. to go sit in trees and try to kill things. His father was massive, charmingly bullying, physically abusive, and someone who Key loved mightily. Some of the most memorable chapters are the ones leading up to that inevitable moment when Key kills a deer. As Key says: “Nobody wants to hear a hunting story that goes like this: ‘I went into the woods, and I saw a deer, and I shot him, and it was amazing.’” He does an excellent job in not doing that. Key eventually carries the scars and the trophies given to him by his father into adulthood and into his marriage. Now a professor of English in Georgia and a humor columnist, he found the balance necessary to be a good husband and a good father and a good man; and every once in a while he still has the urge to kill. Harrison Scott Key knows how to fumble with flannel and has learned his lessons well. You don’t need to be a hunter or even a man to enjoy this exceptional memoir.